This weekend I attended the Salvation Army Coat Sale in Hell's Kitchen with my friend and fellow blogger, Carol (pictured below).The sale began at 9 on a chilly Saturday morning- the cold weather was the perfect inspiration for coat shopping, but not so much for getting out of bed! We got there about an hour late and people were already hauling massive black garbage bags and shopping carts full of stuff out the door. 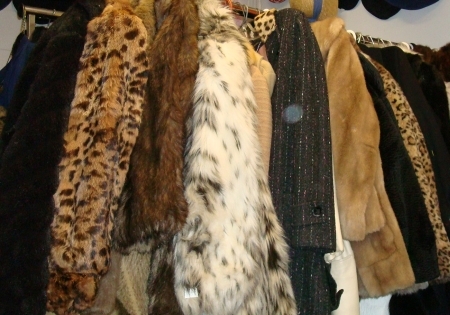 Many were buyers and stylists who got up early to handpick the best vintage pieces. Of course they will later resell most for ten times the price they paid, but can you blame them?! Often their affluent, vintage-loving clients lack the discerning eye and requisite effort for the search. I'm sure looking through thousands of coats in an antiquated warehouse is not everyone's idea of weekend fun, but for me the experience was like treasure hunting... there were some serious leathers and furs to be had. Some of the coats were good, a few were amusing, others were amazing- especially for the price! Carol and I both scored gorgeous, supple leather jackets for $30 each. After thrifting in Hell's Kitchen, we continued our shopping expedition in the Wholesale District and finally headed downtown to Soho to round out the day. We both noticed how our thrifting adventure altered our shopping perspectives. When you can pay $30 for a $1,000 designer leather jacket at a vintage sale, a mass-produced $30 H&M sweater quickly loses its luster. I'm well on my way to a thrift shopping addiction; the amazing finds this weekend coupled with Housing Works Buy the Bag (featured here) have me hooked! Great news for Bon Vivant + a Budget readers who love vintage shopping bargains... There are two more Salvation Army Coat Sales this season in NYC: December 3, 2011 & January 7, 2012. 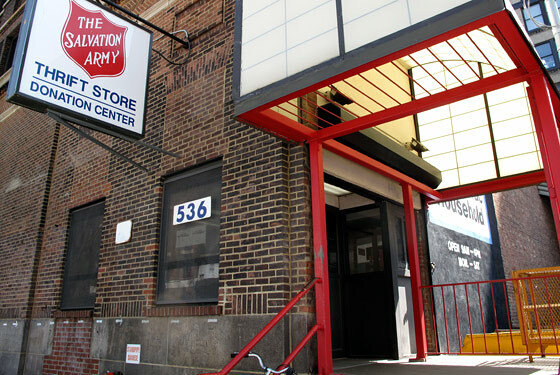 The Salvation Army is located @ 536 West 46th Street between 10th and 11th avenues in NYC. Because of popular demand, another Housing Works Buy-the-Bag Sale will take place on November 19th.